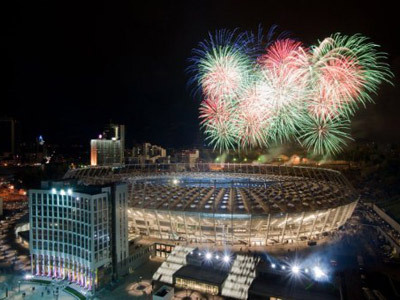 The host venue for the Euro2012 final was officially opened in the Ukrainian capital Kiev on Saturday evening. Though not without some unexpected drama. Inauguration festivities included a performance by Shakira – the Colombian pop singer, who previously performed at the opening ceremony of the 2010 World Cup in South Africa, as well as recording the official theme. However, the star’s 40-minute concert, which brought the festivities to a close, was not the main attraction of the evening. The emotions from her performance were overshadowed by a major fire triggered by a firework show. The incident forced the evacuation of the two central sectors. The firefighters were prepared for the incident and managed to bring the blaze under control in 15 minutes. No one was reported injured. The 70,000-seat Olympiiskiy Stadium, refurbished at an estimated cost of US$470 million, is scheduled to host three group matches, one of the four quarter-finals and the final game at next year's tournament. The stadium's first official match is due to be a friendly against Germany on November 11. 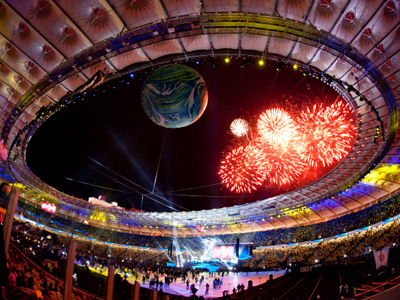 "The reconstruction and opening of the stadium demonstrates to the whole world that we can have business in the Ukraine," said Ukrainian President Viktor Yanukovich during the ceremony. Euro 2012 matches will be played in eight cities – four in Ukraine and four in co-hosts Poland – with the final scheduled for July 1.